I read all three books in just about one sitting, so my comments take the longer-term view. This last book continued the focus on the political intrigue from Book 2 and the fall-out from Yatol's actions at the end of Book 2. It was a nice end to the series and wrapped things up quite nicely, although a little bittersweetly.This book we find ourselves with a mad king, a brooding returned-from-the-dead lover, and a devilish doppleganger which makes everyone wonder who is really who. Merelin's family comes back with her, as well, which was a nice touch because her two older siblings have been relegated to the backstory up until this point. We got yet more time with the characters we already know and got to learn a lot more about them.There is a supernatural fiend hanging around in this book, one which has everybody - from the King to Merelin herself - wrapped in its crazy. Merelin is the only one who can see the monster, which makes it all a little hard for people to believe her. But he's definitely causing chaos, and that's his goal. The ending was a little hard to follow with all of the new armies, crazy bad guy, and everyone wondering who was real and who was crazy. But the ending-ending was really top notch and sweet, a real testiment to the way the author has carefully set it up over the course of the series. 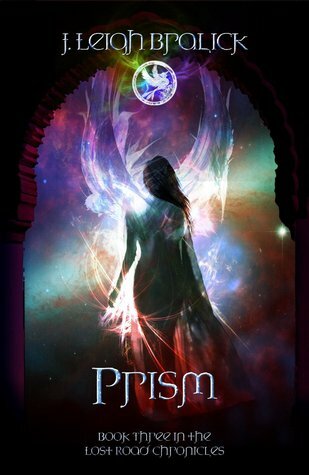 I eagerly awaited the release of Prism after reading and truly enjoying the first two in the series. Merelin Lindon is a highly relatable character, complete with teenage angst and snarky retorts. Prism concludes the trilogy and answers some long-held questions, though I would have greatly appreciated a more in-depth look at Merelin's parents' past and the truth of Yatol's lineage. It seemed as though there was more 'telling' than 'showing' - a lot of information delivered in a slightly chaotic way/scene in the last 15% of the text. Congratulations to J. Leigh Bralick for completing the trilogy and telling such a riveting story! What a great book! I must say that I was sad when I finished this last book in the trilogy because I knew it was over - that is until I realized I can simply go back and re-read them! As before, I found that this author did not disappoint in her book! This was a well thought out plot with characters that were witty and easy to identify with. As I said before, I would highly recommend this entire trilogy to anyone who asks. I am also very excited to see what new works this very talented author comes out with! This third installment in the Lost Road Chronicles doesn't disappoint! The final conflict will have you glued to the page, and the resolution is completely surprising but thoroughly satisfying! As Prism, Merelin's character is revealed in all its many facets, and we finally begin to see just how deeply her character and Yatol's are knitted together. It's hard to say farewell to Arah Byen, but perhaps J. Leigh will return to this rich and delightful world again. I'm eagerly awaiting her next project! Alrighty...well...I love Arah Byen, and I want to go live there. After all this crazy stuff has happened it sounds like a much nicer place to live and Merelin Lindon and Yatol will be my dear friends.I thoroughly enjoy Bralick's world. Her descriptions and characters are wonderful, I still struggle with the obscurity some of the writer's dialogue in her effort to create mystery, but these things are easily fixed with some careful editing.Highly recommend this series. Not happy that the majority of the book felt like starting over as far as character development went. Still enjoyed it, although it could have been shortened...guess that's why they were called chronicles!Sure do like happy endings, but seriously, only ONE kiss?? Not cool, Bralick, not cool!! Good story and well written to a certain extent. The dialogue in some cases could have been clearer, especially when the dialogue gets ramped up due to an argument or high action situations.Overall this is a great read. Excellent book. Captivating, Kept me in suspense ! Great Job. So good! honest opinion, though, it wasn't as good as the first one, Down a Lost Road. review pending.